Business travelers tend to travel frequently so the most suitable luggage for business travelers is lightweight, easy to maneuver, versatile, well organized and durable. Business trips tend to be shorter than leisure trips. Therefore, most people travelling on business prefer to travel light, i.e. with carry-on luggage only. Travelling with hand luggage not only saves you time, i.e. not having to wait for your check-in bag at your destination. It also reduces the risk of losing your luggage, which can be very inconvenient when you are on tight schedule, like most business travelers are. However, business people today not only need to pack a change of shirt and underwear. The modern business traveler tends to travel with mini office in tow. Smartphones and laptops are increasingly considered necessary travel companions of any traveler on the move and not least those travelling on business. This also means cables, chargers, converters and adopters, as well as all kinds of optional extras, like mouse, numeric-entry keypad, iPod, CD player, iPad, GPS, digital cameras, mini speakers, etc. The best luggage for business travelers not only takes good care of the business attire, it also protects the necessary (and valuable) business gadgets. Most business travelers therefore travel with more than one piece of luggage, i.e. one carry-on bag for their personal belongings and another one for the business gadgets and accessories. 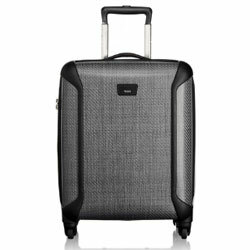 The most popular business luggage for personal belongings tends to be either up-right wheeled carry-on bag or spinner. Some business travelers though prefer wheeled garment carrier bag, as they are the ideal luggage for business travelers travelling with suits. While the most popular luggage for business gadgets and accessories tend to be wheeled laptop luggage cases. Some of the business gadgets also need extra protection as widely used every day, e.g. smartphones and iPads. Strictly speaking, you can use any carry-on bag for your personal belongings when travelling on business. However, if travelling frequently on business, then you want a piece of Carry-On luggage that is easy to maneuver around busy airports and urban environment. This means quality set of wheels and easy-grip handle, as well as strapping system that allows you to attach your extra luggage (like laptop case) to your main luggage piece. 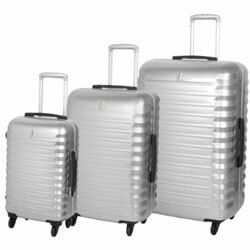 Spinner Luggage is very popular luggage for business travelers, as very easy to maneuver in busy and crowded places. The best luggage for your business attire is garment carrier bag, as it minimizes the wrinkling, which is very important when travelling on business. Garment Carrier Bags have hanger system, holding several garments, and most have different compartments for shoes. The bag is folded over the center to reduce the bulk and make the garment bag suitable as hand luggage. You can either carry your garment bag on your shoulder, or wheel it around like any other piece of carry-on luggage for business travelers. 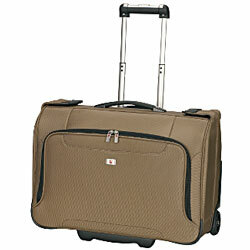 Wheeled garment bag is much easier to maneuver in busy and crowded places. Sure, the wheels and handle system add to the luggage weight and somewhat affect the space available. Most business travelers though feel the pros significantly outweigh the cons. If you do go for non-wheeled garment bag, then make sure the material is light as the bag can be heavy to carry on your shoulder with your clothing and personal belongings inside. If you have to travel with your laptop on business, then wheeled laptop luggage is highly recommended. Laptop with accessories can be surprisingly heavy to carry around but not only that. If you are travelling on business, then you are likely to be carrying various papers and documents with you, which quickly add to the weight of your laptop luggage. It is vital that your laptop luggage protects your vulnerable equipments so look for good quality internal padding. You should also consider the internal structure carefully, i.e. the structure of the different sized compartments. Well-organized laptop luggage for business travelers will help you to stay productive while travelling. And as you will be doing lot of wheeling around, make sure the wheels and handle mechanism is sturdy. Some Laptop Computer Bags offer enough space to cater for overnight stays, which can be beneficial if you do lot of short business trips. You also need good cover to protect your smartphone and iPad when travelling, but not any cover will do. Smartphone and iPads covers tend to be personal statements, i.e. reflect our personality. Which can be good fun but when you are travelling on business, you need to show your professional side. Make sure you own Travel Covers for your smartphone and iPad that can fit in any situation, e.g. in formal business situation. You can get luggage sets aimed for business travels, i.e. including some or all of the business luggage items explained above. Common combinations are 2-piece luggage set (carry-on bag and laptop case) or 3-piece set (garment carrier, carry-on bag and laptop luggage case). You are likely to be using your luggage set frequently so look for good quality as well as good internal organization. Choosing the best luggage for business trips in one thing, packing for your trip is another. The most important thing when packing for a business trip is to pack strategically. It will not only save you valuable time when packing, it will also save you lot of hassle when going through airport security. If you are travelling with Carry-On Luggage only then make sure you keep your toiletry bag at the top of your bag for easy access if needed. Make sure all liquids are within the current regulations (currently less than 100 ml per container). Those business travelers that do check in their luggage often have some basic spare items in their hand luggage, e.g. clean underwear, socks, shirt, toothbrush, etc. It can save the day if your check-in bag gets lost. Those that travel frequently on business know that travelling on business is not the same as going on a holiday. Business travel is usually a hard work, while vacation is pleasure. This though does not mean that business travel cannot be comfortable and even enjoyable. 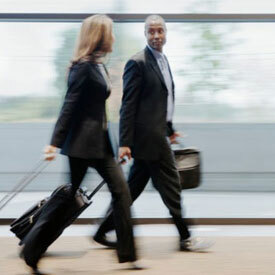 Check out our Top 10 Business Travel Tips That Will Benefit You And Your Business . They can save you valuable time and make your business travel as comfortable and enjoyable as possible.